Pulikaichal is a preserve which stays for a few months in the fridge. This when mixed with rice is called Puliyodarai. Soak the tamarind in warm water and squeeze out thick juice to make 1 and 1/2 cup pulp. In a heat kadai and fry the ingredients for the powder, stirring continously till golden. Allow to cool and grind to a fine powder. In the same kadai heat 1 cup oil and add mustard seeds. When it crackles add all other ingredients for the seasoning and fry till golden. Lower the flame and carefully pour the tamarind pulp in to the seasoning. Allow to simmer till the pulp is thick. Add salt and the powder and mix well. put off the flame. Allow to cool and store in food safe, air tight containers in the fridge. Wash and prepare rice in a pressure cooker, with 1 cup rice and 2 cups water. Allow to cool a bit and transfer to a shallow dish. 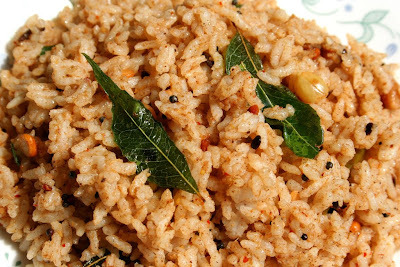 Pour 2 teaspoon oil in rice and curry leaves fried in one teaspoon til oil. One of my fav rice...i also made this two weeks ago..waiting to be posted.Hey you can send lemon rice for AFAM.. Kitchen Flavours, welcome here and thanks for comments.